In 1972, my wife, 4 children and I joined the Transcontinental Tour from Montreal, Canada to Tijuana, Mexico. 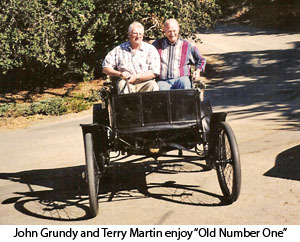 Millard Newman led 21 pre-1915 autos on this, his second of many successful cross country tours. Our 1911 Chalmers constantly fell apart on the trip; but somehow we managed to make it run for the complete distance. I was impressed with two Packards that seemed to have very few problems; Howard and Judy Henry's #38052 and Ernie Gill's #26267. For the next Transcontinental, 1976 Seattle to Philadelphia, my wife insisted we purchase the best automobile we could afford, or there would be no trip. I will be forever grateful to her for this. Hence, my purchase of #16591 from Bob Erausquin in the fall of 1975. At the time of purchase, Bob showed me a list of Packard owners that he had written down on the back of an envelope. I obtained a copy from him and thus started my love affair with Packards and searching for all the early Packards that are known to exist in the world. Retiring from business in 1988, I found time to computerize the original listing and combined it with two other lists. One the efforts of Don Weber and the other of Terry Martin. I started working on the task of contacting the owners and gathering information. In addition to my wife, two special people have spent many hours in the car with me over the last ten years tracking down "Packard Numbers", Dr. Flywheel (Don Mates) and Herb Lederer. So far I've had the privilege of visiting and touching 113 of the 159 known cars. A word of thanks (in no particular order) to: Bob Erausquin - Tim Martin - Don Weber - Terry Martin - Don Mates - Herb Lederer - Jim Conant - Frank Gardner - Charlie Wallace - Bill Boudway - Ron Adams - Various museum people - and each and every owner. There have been many pleasureable hours put in to this effort...I hope you enjoy. UPDATE - At the age of 84, my father, John Grundy, passed away in late November, 2017. With other Packard owners visiting him up until the last days of his life, his love of Packards was with him until the end. He will be missed by many. Thankfully, Tim Martin and others, have agreed to continue running the Packard's Online site. They will be doing what they have been doing for years, which is keeping all the the information up-to-date and reliable. Please see the "Contact Us" page for information on how to add or correct anything you see on this site. The Grundy family thanks Tim and all the other Packard owners who have been my Dad's extended family for many years - Steven Grundy.